Shopping in Hervey Bay on the Fraser Coast of Queensland. Shopping in Hervey Bay covers the necessities without being a shopping Mecca. The potential for development is huge; particularly as the demographics of the area continue to change. The Ad Hoc development of the CBD is quite evident. Of course, this is a result of the nature of the original small centres that made up this holiday retreat. However, Rome wasn’t built in a day and well known national, and international franchise outlets are regularly opening in order to satisfy more and more of your shopping needs and whims! It seems that a number of opportunities to create a central heart retailing district, buzzing with soul and character have missed the mark. Retail developments to date have led to a sprawling mass of unconnected shopping areas that lack a relaxing holiday flow. Oh well; who wants to waste their leisure time shopping; after all this is paradise! The green belt between Main St and Boat Harbour Drive that includes USQ and the library offers a real opportunity to create an attractive green space surrounded by a large Mall experience incorporating Main St and Boat Harbour Drive shopping centre's. Of course we're here for the climate and the geography, no doubt the retail environment will change to meet the ever evolving local demographic. This change means the opportunity to bring new retailers to Hervey Bay is enormous. The phrase from the movie; Field of Dreams – “Build it and they will come” is a very apt description of the Hervey Bay retail potential. Two of the more recent (2008) examples of this phenomenon include Hungary Jacks and Big W. Bunning’s also has a relatively new store along the main arterial city route. The Big W development has seen a revitalisation of the Pialba Place shopping precinct. The large department store retailers represented in Hervey Bay include Target, and as of June 2008, Big W. K-Mart will be the cornerstone retailer within the new Stockland's complex. Construction began in May 2013 after at least two false starts since the Global Financial Crisis in 2008-9. Spotlight had a site earmarked for development, however as of writing there is no firm construction date set down, and they may have changed their plans considering the current economic climate. Need more detail? 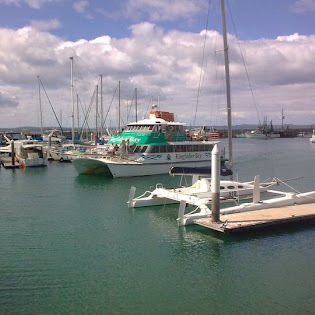 Click here for a list of some of the shopping centres dotted around Hervey Bay that you can visit during your holiday. A list of the latest discount National Chain Catalogues can be found by consulting the local internet and phone listing. Most but not all of the retailers from Hervey Bay are represented, but nearly all can be found in the Greater Wide Bay region that includes Gympie, Maryborough, Hervey Bay and Bundaberg.